As Christians we give back to the church out of our gratitude for what God is doing in our lives. We give out of our recognition that the church is transforming lives and the community in which we worship. We give so that the ministries and missions of our congregation can continue to thrive in Bonham and around the world. Regular giving is a spiritual discipline that helps to orientate ourselves to the Gospel of Christ. This spiritual discipline is encouraged for all at First UMC Bonham. There are a couple of different ways that you can give. If you miss church services on occasion due to travel or other commitments, consider setting up an automatic giving schedule. Your consistent support is vital to our Church. To set up a recurring contribution, simply talk with your bank and ask them how to get one set up. You can even use your bill-pay option with your bank to make donations directly to the Church. Your bank bill-pay system will require the Church's banking information. Just call the Church Office at (903) 583-3314 or ask the Treasurer, Mary Ann Pack. She is in the Church Office on Tuesday mornings. Your gifts are greatly appreciated!! Do you use Amazon.com to shop? Would you like to help the church earn free money? 1) Instead of visiting www.amazon.com for your online shopping needs, visit www.smile.amazon.com. The website is exactly the same as what you see on amazon.com, the only difference is that it will ask you to choose a charity. 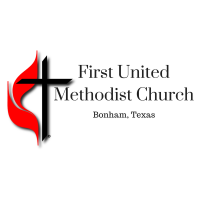 2) Simply type in "First United Methodist Church Bonham" as your designated charity. The Amazon Smile Foundation will donate 0.5% of the price of your eligible purchases to First United Methodist Church Bonham, TX. For more information visit www.smile.amazon.com.